A common method used to deter against image hotlinking or reusing the image that you’ve created is by watermarking. A visible watermark in the form of a logo or text will be stamped to show the owner of the image. Stamping the watermark at the corner of an image can be easily bypassed by simply cropping it away while placing it in the center can annoy the viewer. Another solution that can be used to protect your image is to sign it with an invisible watermark. The invisible watermark does not annoy the viewer while it can be proven that you are the owner of the image which can greatly help in a take down action. Here we have 5 software tools that can add proof of ownership to your digital images. SignMyImage is a shareware tool that cost 14.99€ and comes with unlimited free upgrades. It allows you to sign your image with an invisible signature so that it can be used as a proof of ownership. There is also a batch signing and detection feature but it’s disabled in the trial version. To speed up the process of signing and detection, the program has been made to automatically use multiple cores of your computer’s CPU. Signing an image with SignMyImage is very easy. First, run SignMyImage and load the image to the program. Click on Menu > Help > Open Shorter URL. Enter the URL of your website and click the Generate button. Copy the generated code. Go back to SignMyImage, click the “Sign Current Image” icon and paste the code that is generated from the URL shortener. Click the Test button and make sure that your default web browser will run and forward you to your website. If that is working, click the OK button to sign the image with the code. You’ll need to save after signing the image. To detect the signature on a signed image, you’ll need to load the image into SignMyImage program, click on the “Detect Sign On Current Image” button. If a sign is found, it will show the 10 character sign and clicking the “Get More Info” button will bring you to the owner’s website. Signed images are able to survive cropping, compression and scaling. Registered users of SignMyImage gets access to their image spider where their web crawler will notify you if they found any signed image on a third party website. Do take note that only 24-bit images can be signed. Icemark is a newer shareware product on the market that can embed an invisible watermark to digital images and it cost $49.95 for a single license. Basically you will sign the image with a private key that is known only to you. 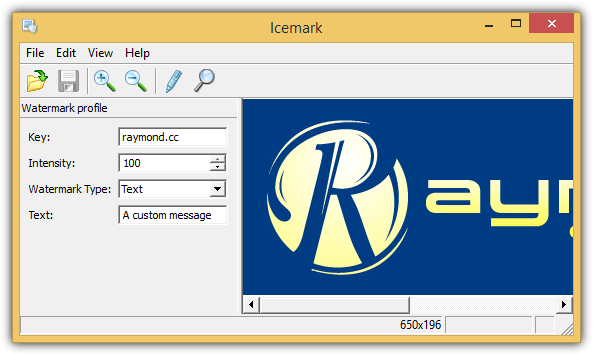 There are 3 watermark types in Icemark which is Identification, Image Id or Text and they are meant for your reference. For example, using the identification will only watermark the image while the Image Id allows you to assign an ID together with 3 indications which is “Restricted Use”, “Do Not Copy”, and “Adult Content”. If you prefer to embed a custom message to the image, use the Text type. To detect the invisible watermark signed by Icemark, load the image into the program, click the magnifying glass icon and it will tell you if the watermark is detected or not. Make sure the correct private key is entered before detecting the watermark. Batch processing is available in File menu where you can automatically process multiple embedding or detection. 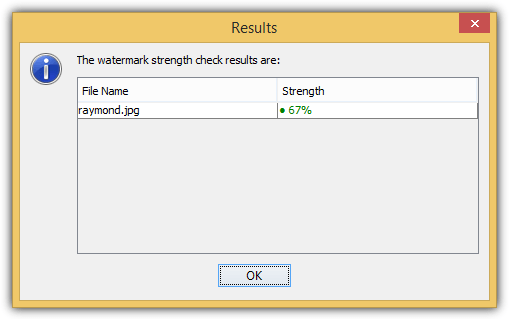 Images that are watermarked with Icemark are resistant to common image editing operations such as compression, distortions, cropping and etc. OpenStego is an open source application that can watermark images using an invisible signature. Using OpenStego is very straight forward. The first step is to create a signature file based on passphrase. Then use the signature file to watermark the images. Do note that OpenStego runs on Java and the digital watermarking feature is still in beta. We’ve got very weird results after embedding the invisible watermark using the signature file. First of all, the watermarked file size is much smaller than the original and there is a noticeable quality loss. Moreover, we are only seeing a 67% strength for the unedited watermarked file which may not be convincing enough to proof that you’re the owner of the image. The meaning of Steganography is hiding information within another data. By using this technique, you can actually embed a text file to an image file. The image file with an embedded hidden text acts like a normal image file and can be viewed using any image viewing software. 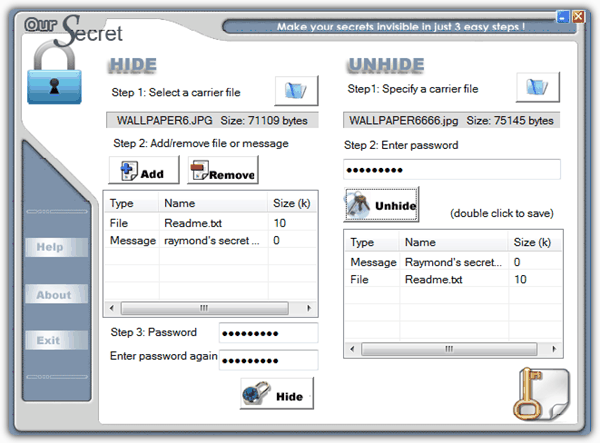 However the hidden text can be revealed when the image is opened using a special software together with the correct password supplied to it. There are quite a number of tools that can do this and we’ve already covered some in an article with 5 different ways to secretly hide a file or message inside another file. Although this method works, it will only work if the image is untouched. If the image has been edited in any way, the hidden embedded text will be removed and you won’t be able to prove that you are the owner that originally signed the file. You can find the Digimarc plugin bundled together with Adobe Photoshop and it requires a valid subscription to work. 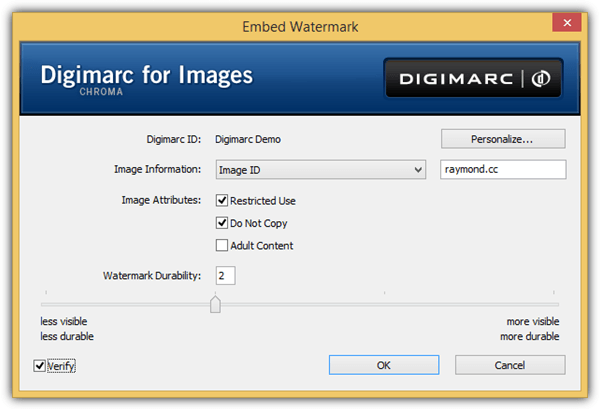 To watermark your images using Digimarc, run Adobe Photoshop, go to Filter > Digimarc > Embed Watermark. If you’ve purchased a subscription, click on the Personalize button to enter your ID and PIN. You can now give more information about the image such as the copyright year, image ID or transaction ID, then followed by selecting the image attributes which is similar to the one that you see in Icemark. There are 4 levels of durability for the watermark whereby a more visible watermark is more durable to changes on the image after an edit. To verify the watermark, load the image into Photoshop, go to Filter > Digimarc > Read Watermark. If you’ve watermarked under your account, it will show your ID instead of the Demo and the Web Lookup button will connect the viewer to the author of the image. 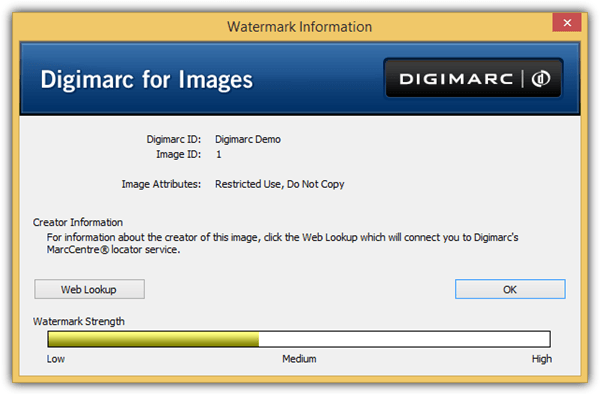 The basic package of Digimarc cost $49 per year and it allows up to 1000 digital watermarkings but it does not come with the Digimarc Search Service that shows you where your images are found on the Internet. Do note that the image requires at least 256×256 pixels to retain a reliable watermark. 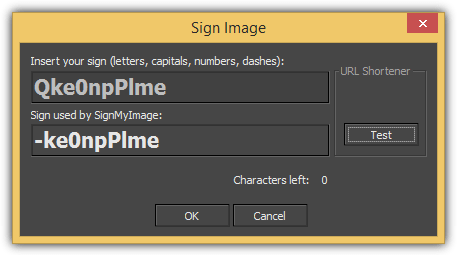 Additional Information: SureSign plug-in for Adobe Photoshop by Signum Technologies can also embed and read watermarks. The cheapest option cost US$220 per annum per workstation for individual users and evaluation copy is only available upon request. @ms Regarding using visible watermark, uploading smaller resolution to internet while retaining larger files. I feel invisible watermarks, such as Digimarc with internet search is very helpful to provide more peace of mind when you are actually selling larger high quality images — not just posting them online. Thank you!!! I just held down the left touch pad and powered on. Vane right out. Use a software for usual watermarking….plus this for the invisible watermarking. This is an interesting idea, just like digimarc, that also applies an invisible watermark, but you can also make it noticeable. As a photographer myself, I’d rather have a visible watermark, that way it helps to deter them from downloading it since they know it will distort the image when trying to photoshop it out. But then again – you don’t watermark any high resolution image, you always keep the original and optimize the new one for web so it’s small. Then if someone does try to say the image is theirs, well, you have the original as proof and they have nothing. Thanks Raymond for this tip! !